In the “General” configuration the paths of import and export are now separated. The export file now includes information that were missing before, like diagonal cuts, categories, elimination, rack informations, etc. The native Lisec file import now includes the importation of the Batch information. In addition, it is now possible to import the informations for the printing of labels (using the file info.txt generated by Lisec), which can then be printed by Perfect Label. A new file STOCK_IMPORT.ini is configurable if the user prefers that, during the import of Stocks from .IMP files, a confirmation for the overwrite of the families should be asked or it should be automatic. By default it is considered that the confirmation is not requested and that the families are not overwrote. Similarly to how it is possible to manage different configurations on the same computer, it is now possible to save and restore different stocks. In addition, it is possible to partially restore the stocks, choosing which families to insert or overwrite. It is now possible to restore the configuration of one or more machines, leaving all other parameters unchanged (for example Project Path) by clicking on the “…” button in the configurations window. By setting the version of the movetro stock to “2”, it is now possible to differentiate the sheets and the tails read from the Movetro database. For every numerical control it is now possible to define the “Project Copy Path”, in which a copy of the project will be saved after pressing the Numerical Control button (Cutter). To help the user a new button has been added in the information window of Perfect Cut that allows the user to copy the serial number of the key. The licence information window is now reachable by clicking the button with the R.O. logo, instead of the old yellow question mark one. In the “Family” field the choice of printing the area of the piece was added, handled like the weight. The vertical/horizontal alignment is now configurable for QRCode, DataMatrix and BarCodes too. By right-mouse clicking on a single row of Perfect Label, the possibility of printing the label of the selected row has been added. It is now configurable a threshold for the printing of package labels, under which Perfect Label will print every label instead in addition to always print the last label of the package. The view of step unit glasses has been improved and it is now possible to define negative staggers (which inverts the direction of the value). 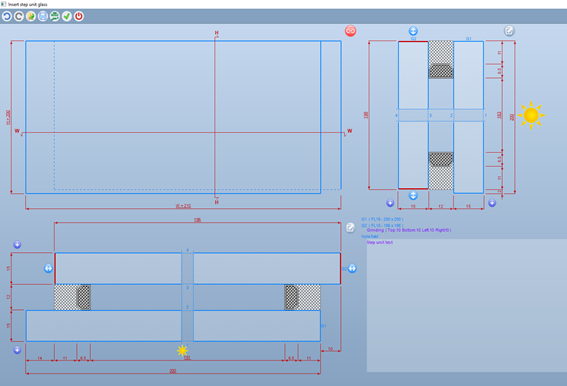 In the CAD configuration the possibility to define a default offset has been added, handled like the default trim value. The name of shapes can now contain spaces and dots. The IPF format now supports a new ?ATAN2 function (for example A=?ATAN2(yvalue,xvalue) ) and the handling of Qangle quotes has been improved. The two programs will now generate production logs also for the GFP cutting machines, both monolithic and stratified. Perfect TV can now sync with the Vetromac numerical control. For the Rjukan bender the type of gas is now handled, using the file GENERIC.INI. The Simec bender (Bottero) is now supported. The output for Line Server now allows the possibility to define the processing of LowE, the filletting and the roughing out of the pieces using the Department field of the interested pieces and configurating the LISEC_TRF.ini file. The format of the numbers in the pieces section of the ISO file is now configurable to decimal (normally in exadecimal) by setting the flag “Index Pieces in decimal”. The “Order” field is now displayable in the center of the piece in the printing layout (after a configuration) and it now possible to insert it in the pieces section of the ISO file. The management of sequential cuts by difference has been implemented for the stratified NC. The LowE squaring management now creates a better path to avoid consuming the wheel from only one side. The save path of report files is now configurable in the REMOTE_REPORT.INI file, for both monolithic and stratified.